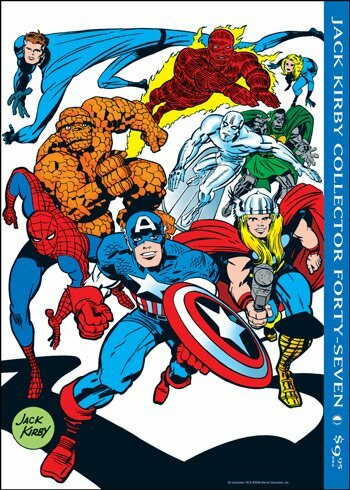 Just saw the cover of Jack Kirby Collector #47, due out this fall. The theme of the issue is super teams, and I stretch that notion a bit by taking my column's space to talk about Herbie the Robot. Herbie was actually designed by Jack for Hanna-Barbera's Fantastic Four cartoon. The Human Torch was under another license and couldn't be used for the series, so HB asked Jack for a new replacement character, suggesting that it be a cute, little robot like that R2-D2 guy that was so popular at the time. Legend has it that Frank Welker, who voiced Herbie for the cartoon, developed the character's voice and then some of the sound engineers put a metallic twang to it to make it sound more robotic. When Frank heard they were doing this, he said that it was entirely unnecessary and he altered how he used the character's voice to include that metallic twang, and no one could tell the difference! Frank later met Jack and Roz Kirby at some party, where he was evidently able to mimic Jack's voice so perfectly (and so quickly!) that even Roz couldn't tell the difference between them! I can believe it. Frank Welker's name is familiar to me because he voiced more than half a dozen characters in the Transformers cartoons and movie. In fact, looking him up on IMDb reveals (in addition to a ludicrously long credits list) the factoid that he's considered a "voice god" in Hollywood. Truly amazing.